April 18, 2016 – Today, we’re traveling back in time by rappelling down the steep face of New Jersey’s Palisades Cliffs, and down to the Alpine Boat Basin, just north of the George Washington Bridge. Our destination is the historic The Kearney House, formerly called the Cornwallis Headquarters, based on the local legend that the British general stopped here for a night during the American Revolution. The Kearney House dates back to the mid-1700s, and in the centuries since has been a home, a riverfront tavern, a police station, and a shrine to history itself — surviving not only time and development, but Superstorm Sandy. You can tour The Kearney House, but also enjoy special events such as Punch & Pie Tavern Nights (April 23 and April 30, 2016) and Tales of the Macabre with readings from local fellow, Edgar Alan Poe. With music, mirth and libations, this is hardly your typical velvet-rope historical experience. Our guide on this visit is Eric Nelsen, historic interpreter for the Palisades Interstate Park and co-author of the book about this 100,000 acres of open space: New Jersey’s Palisades Interstate Park. 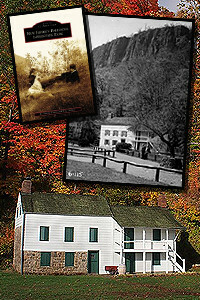 You can check out what’s happening at The Kearney House and the park’s many other attractions by visiting NJPalisades.org, liking their Facebook page, or following @PalisadesParks on Twitter.